This huge, rather mystical looking house, is situated on a beautiful plot with an amazing backdrop of woodland areas and tall trees. It has stunning views of the lake from the front of the house and is located in the midst of rustic looking gardens. The exterior of the house is a perfect combination of natural stone and wood giving it a rather interesting, if yet almost medieval, look and feel. The large balcony area at the front of the house stretches nearly the full width of the house, giving the owners an amazing view of the lake and the mountainside in the distance. Inside, the interior is totally unique, with a rich and interesting atmosphere that adds to its very rustic style. There is a large amount of stone inside and outside the house and really gives it a homely, yet archaic feel. 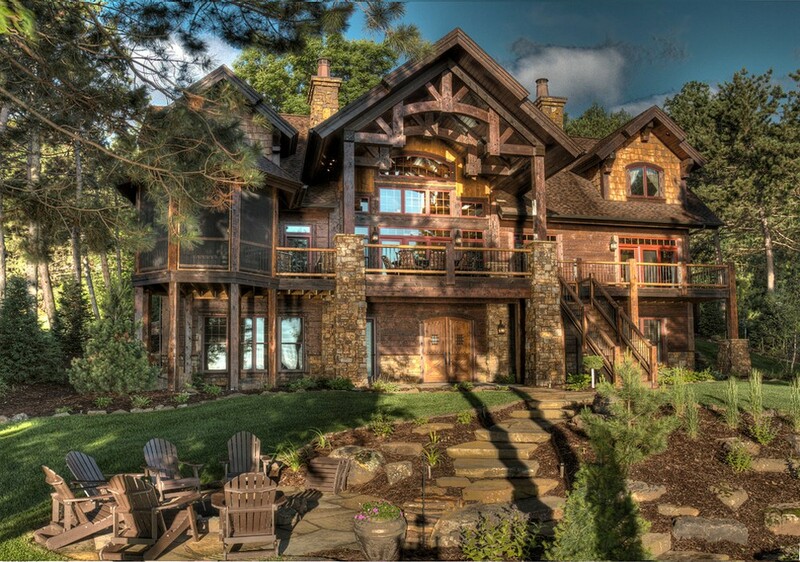 This luxury country house is located in Minneapolis, USA, and was developed by the American company Lands End Development.